This is a part of me I didn't realize I would enjoy. I actually really like talking to younger kids. After so many years of being the younger sibling surrounded by older folks, and then itty-bitty babies (my nieces), I forgot that 4th graders really are people and great thinkers-- they just are a lot smaller than adults. But that doesn't mean their ideas are as small as they are! My sister's friend asked me to go give a talk at their elementary school. Those 4th graders were a blast. Then the church I grew up going to asked if I could give a talk to their 6th and 7th graders. Then I went to do a talk at my old elementary school to the 4th and 5th graders (and got to meet some of my old teachers)-- which brought back a lot of fun memories, plus some of the teachers couldn't believe that I wasn't my shy, quiet self. It was especially awesome because I got to catch up with my 5th grade science teacher, Ms. Chu. 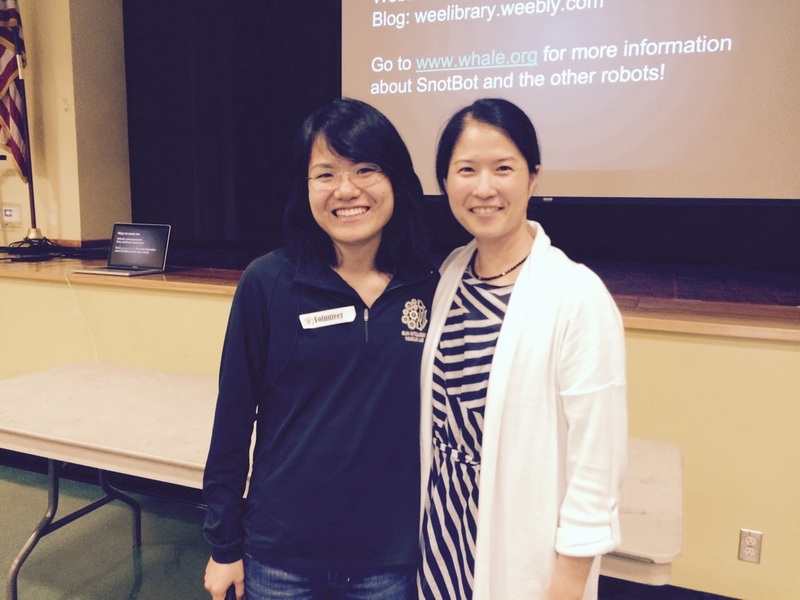 Soon after, I participated in the 2015 Wellesley STEM Expo with WALL-E, and spent a few hours discussing robotics, STEM, Olin, and engineering with a bunch of parents and their kids. Me with my 5th grade science teacher, Ms. Chu! Some of the 100+ kids who decided to stick around and ask questions at Carver. However, I struggle with STEM-focused activities, and it's not being a role model that I struggle with. It's the conflict of STEM education that's focused towards women. Never in my adolescence or childhood did I ever feel that anyone denied me access to science or technology or related fields. I never felt that people were disparaging of my "nerd" tendencies or how I geeked out about building a telescope. I realize it's a problem that's talked about but it's not one that I experienced growing up. I definitely think it's important to encourage all people who don't realize that engineering is a career path they can go down that engineering is a possibility. However I don't think painting the picture that young women are being discouraged to pursue technology is necessarily true (at least not before college). I think if anything, it's something that is more prevalent when you get into college and beyond. If anything, it's middle school peer pressures and perceptions that might make girls feel like they're "too dumb" to learn something, and that's where a focused STEM course can change that sort of perception (and is also where role models can help). Additionally everyone throws around these buzzwords without really understanding what the words imply. I see a lot of effort of so many people trying to put together a collaborative workspace because they think they need one to create creativity or inspire their kids. I definitely see those tools as awesome, though I'm not sure they'll produce the results folks were looking for. Coding-- everyone seems to think you need to learn to code, when the code is just a tool for translating your thoughts into something a computer can understand. Everyone thinks this is a skill you must have, but they never really talk about the thought process you have to develop, first. 3D Printers -- everyone knows you "need one in your school." But no one ever stops to wonder what the infrastructure is like to support having a 3D printer in the school. They're not maintenance or hassle free... I know that from personal experience. Makerspace -- generally a place where people come to learn or build their ideas. But in a K-12 setting, what this could offer in terms of extracurriculars or physical resources is really arbitrary. In some sense it's a glorified shop-class workspace-- a concept that was around forever and is now making a serious comeback. Creativity -- build it and they will come, or so it seems by having a makerspace. Throwing money at a problem to bring in hardware and tools that no one's familiar with will obviously spur creativity and kids having amazing thoughts or bring seemingly different things together to build a solution. Ehh, not buying it. I think creativity is something that can be surpressed easily by fixed mindset thinking but I don't think necessarily having tools available will spark it, either.